How do abrupt changes in the climate--thresholds in the climate system--affect us? And how can the study of paleoclimates--climates in past geological ages--help us to understand present climate changes? 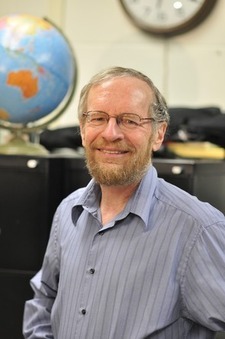 Richard Alley, professor of geosciences at the Pennsylvania State University, will explore these questions in his Nobel Conference presentation. Alley’s work focuses on climate reconstructions using polar ice cores and the dynamics of polar ice sheets. By the early 1990s, Alley and colleagues gained widespread attention in the climate science community for seeing in the ice core data evidence that dramatic climate changes had occurred over time periods as short as just a few years. He explores these findings in his book The Two-Mile Time Machine. In the past ten years, Alley has been exploring how Antarctic and Greenlandic ice sheets will potentially respond to climate change, and how those responses will affect sea level rise. The author of more than 290 scientific papers, Alley is also an important public voice on the science of global climate change. A frequent interviewee for PBS, NPR and the New York Times, Alley has received numerous awards for his leadership in improving climate science communication to the general public. Among his many awards, Alley was a member of the 2007 team awarded the Nobel Peace Prize.